Come on in and join us! 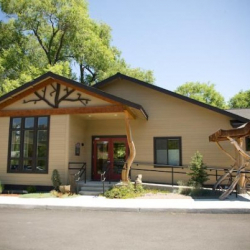 At High Desert Chiropractic we offer a warm and friendly office space featuring floor to ceiling windows, a large fish tank to help you relax, and entire office styling with proper Feng Shui in mind for the ultimate in healing energy. In addition to the great comfort of our space we are also very fortunate to have a talented massage therapist, a gracious front desk manager, and a knowledgeable chiropractic assistant that can help you in most any way. At High Desert Chiropractic we have a whole body perspective and treat patients as a complete person, not just their symptoms. Excellent doctors and staff, with excellent results and follow up. The doctors are so knowledgable, they've helped my husband, my babies and me to live healthier and smarter for years and for years to come. We strive to provide organic healthcare for the whole family! With a natural approach to healthcare and the individual in mind, we don’t mask the issue, we treat it!